Just above my right elbow I have a tattoo. 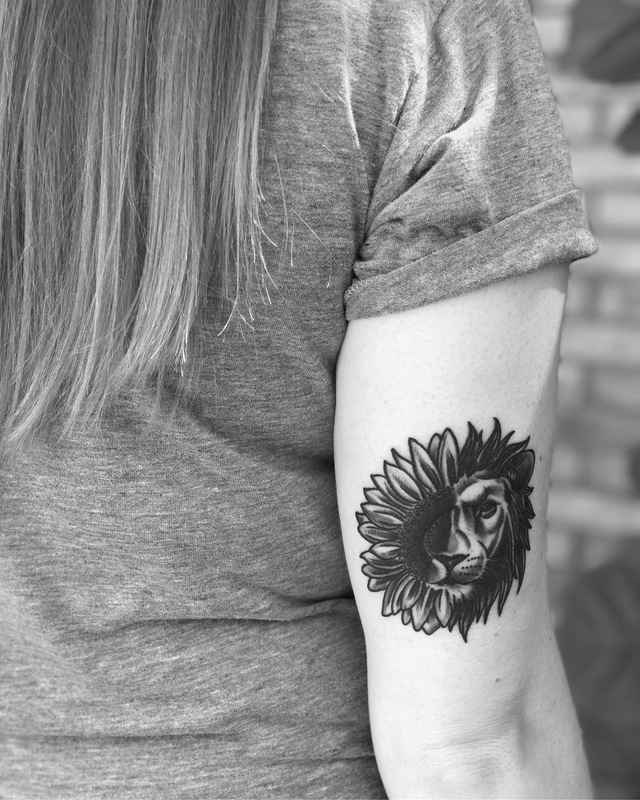 It’s half of a sunflower and half of a lion. My tattoo artist didn’t ask me what it meant when I had it done. He did say, “Ah yes, the old lion turning into a sunflower trick,” which I wish was a real reference so I could tell people that when they ask me what it means. Because, honestly, its real meaning has some heaviness to it. For a long time I tried to use a tough exterior to overpower my brokenness. I didn’t let myself cry. I didn’t want to talk about my feelings. I didn’t let things get to me. I thought I was in a pretty good place. I had “overcome” my hardships. Slowly I started realizing that wasn’t a healthy way to live. I wasn’t letting people in. In fact, I was pushing them away when I needed them the most. I wasn’t being honest with my loved ones or with myself. I was just bottling everything up. I’m not here to tell you I’ve found the perfect coping strategy. But I can tell you that it’s a work in progress. I’m striving for balance. Once I discovered the unhealthy place I was at, I essentially swung to the opposite end of the spectrum. I cried. A lot. Too much really. I wanted to talk about my past all the time. I let small things affect me in a big way. I was starting to let my brokenness be an excuse for my actions. Fairly recently, I discovered this wasn’t a super healthy way to live either. There needed to more balance. Who I was and who I am becoming. Keeping my story sacred and letting people in. Learning to love myself and continuing to find ways to grow. It’s been such a slow process. Each time I have a revelation, I want it to be followed by instant and permanent change. It never is. It takes time. I love getting to celebrate progress in recovery and finding healthier ways to live but I think it’s also important to remember the feelings that come along with this progress. Frustration—when change doesn’t come as quickly or as permanently as I’d like. Fear—that I won’t overcome my past. Guilt—that I’m negatively affecting those around me and not being the best version of myself. Confusion—Why did this happen to me? My mom? My brothers? I get to feel those feelings because they’re real and part of the process. But I’m learning not to get stuck in those feelings. I’m learning to focus on the positive ones I can find. Finding joy in each good day, in the healthy coping strategies, in the person I have become. Finding hope in the idea that if I keep pushing myself, things will only continue to get better from here. Finding peace in knowing that my past is my past and I get to choose how it impacts me. Finding purpose in doing what I can do because of the things I’ve experienced. That’s where my tattoo comes in. It’s a reminder. 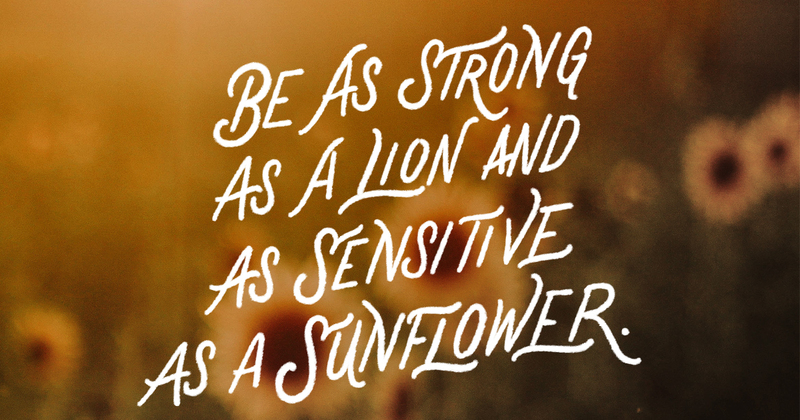 A reminder to be as strong as a lion and as sensitive as a sunflower. And my reminder to you would be this: Remember where you came from. Let it inspire you. Don’t let it define you. Strive for balance. I love this so much. I have a tattoo on my wrist of the sun and moon. To me it’s a reminder that we need both the good and bad experiences in life to appreciate where we are now. But I understand, be as bright as the sun, but also as mysterious as the moon. Thanks for sharing your story. I know how hard it is. Becky, this is beautiful. You are an awesome person. It has been wonderful to follow along as you have grown. Thank you for your courage in saying this, made me feel less alone today. Thank you for sharing your story. Add physical abuse to it and this piece would relate to me even more. I am trying to make it to the other side, to the better side. Its hard. Particularly because my past is still very much my present. Its quieter. But its there. I am struggling with all the things you mentioned. Fury, Rage, Frustration, Confusion, Hopelessness. But i am trying. Thank you for making me feel less alone. Internet/Social Media has been quite a blessing. People like you who share their story, you have no idea what a beautiful, brave and kind act it is. It has literally aids healing and gives so much perspective to people who are struggling. Thank you for putting it out there in the universe for others to benefit from. I hear you, and I could have written half of this. I’m lucky in the sense that I knew from age 14 that mental illness runs in my family; it still took me far too long to understand that it was perfectly ok to need help with dealing with my own depression and anxiety even if they weren’t as dire as my father’s schizophrenia had been, even if I didn’t have a horrible childhood, even if everyone wanted (wants!) me to “get over it” rather than talk about it. Thank you for sharing your story – balance is so important, and this is a beautiful expression of that concept!